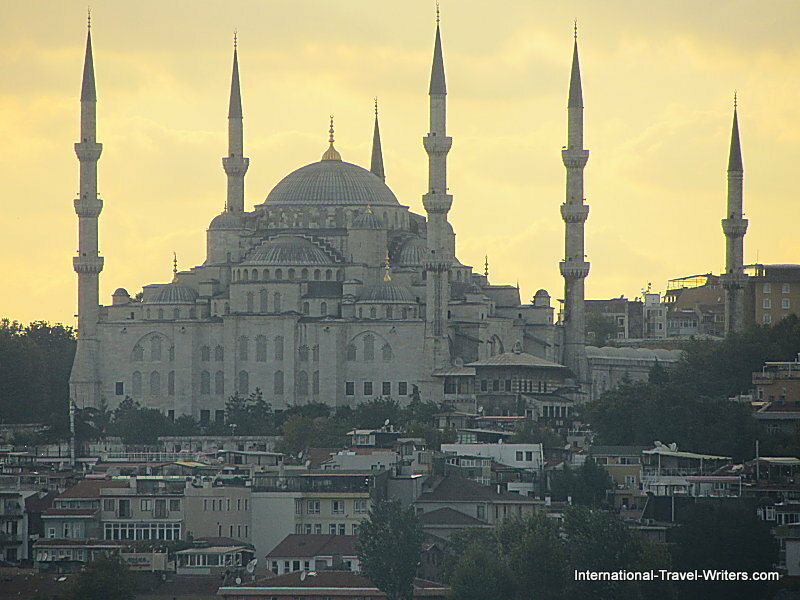 Istanbul is a city that almost defies description as it reaches out to sharpen and hone your senses. The pungent, sweet smell of roasting corn wafting through the air to find your nostrils...with the smell of the durum-wrapped meat kebabs competing for attention. The noise of brutal and snarling traffic trying to maneuver slowly through the crowded foot traffic slowing their frustrated momentum (at $12 a gallon for gas not an inexpensive task). The muezzins calling from minarets with clock-like precision or carpet sellers hawking their wares with loud voices that assault your ears. Your eyes fill with colors of every hue in the spectrum inside the Spice Bazaar while outside they absorb conflicting views of the secular and religious, modern and historic, overwhelmingly, richly beautiful versus the pitifully, poverty stricken ugly...all this and more...is Istanbul. 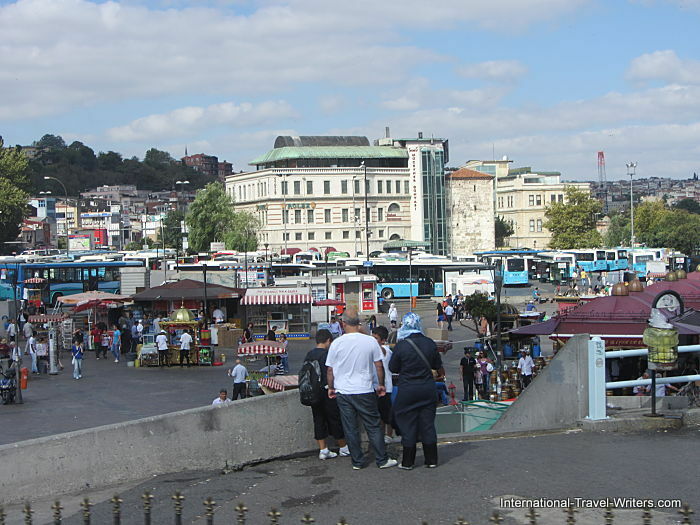 Istanbul, a sprawling, noisy, exotic city of symbolic Colossus proportions, with one leg planted firmly in Europe with the other embedded in Asia that would make the Rhodes statue of ancient times pale in comparison. 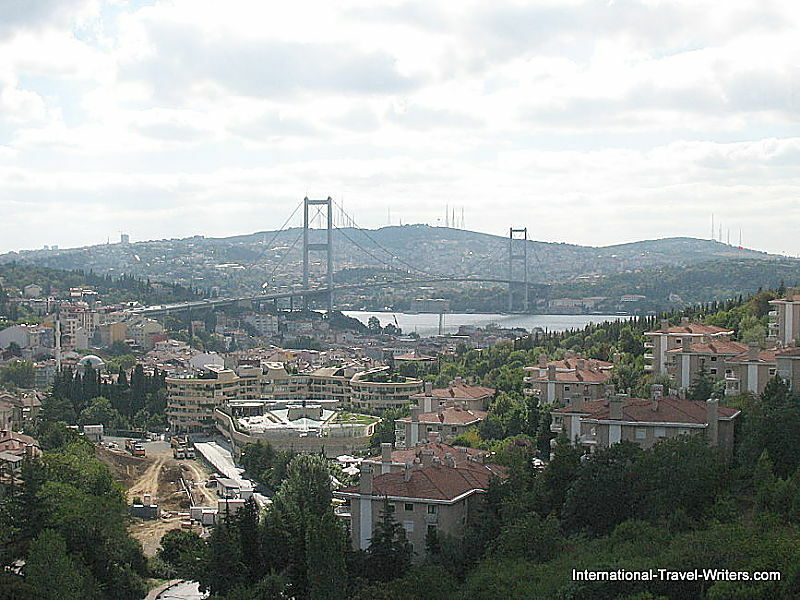 The Bosphorus Bridge (seen above) completes the joining stance. The former capitol of three empires (Roman, Byzantine and Ottoman) over nearly two thousand years...it now encases up to 20 million people that are found interspersed with the remnants of all three civilizations that dot the city. Two cultural pieces melding, two time periods that meet, two very different worlds that mesh, these are Thrace (European Turkey) and Anatolia (Asiatic Turkey). Thrace, the European part of Istanbul, is just a 3 percent particle of the gigantic mass of Turkey but it has miles of beaches and verdant mountains on the coasts of the Black Sea. 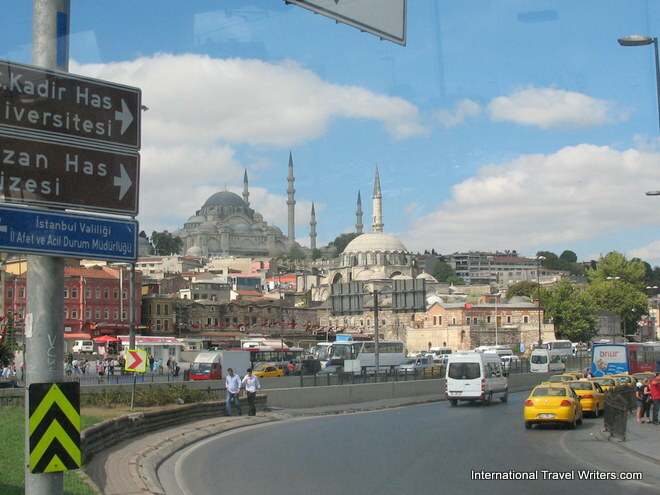 It has Ottoman architecture along with sparse Greek remains...and of course there is the picturesque Golden Horn. Anatolia, the Asiatic Turkey, is also called Asia Minor and it's a peninsula surrounded by four seas; the Black Sea, the Mediterranean, the Aegean and the Sea of Marmara. 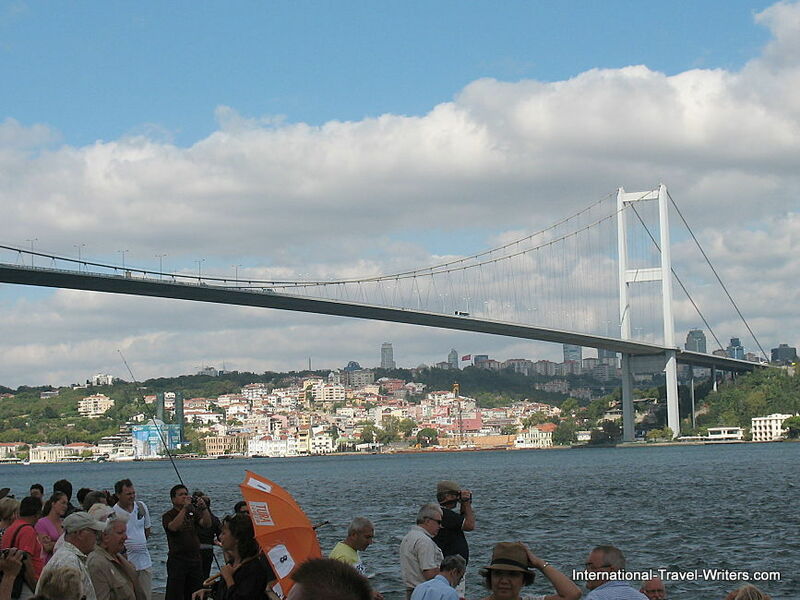 It is separated from Thrace through the straits of Bosphorus and Dardanelles. 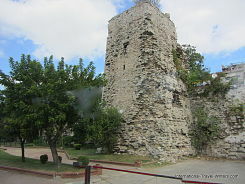 It has steep Pontic Alps, and the historical Marmara Region where lay the legendary Plains of Troy. Lining the waterfront are vendor stalls selling such things as turnip juice (not great), tea (lots of choices), and fish sandwiches (tasty). There were also stalls with a variety of souvenirs and booths selling boat tickets to tour the Prince's Islands. 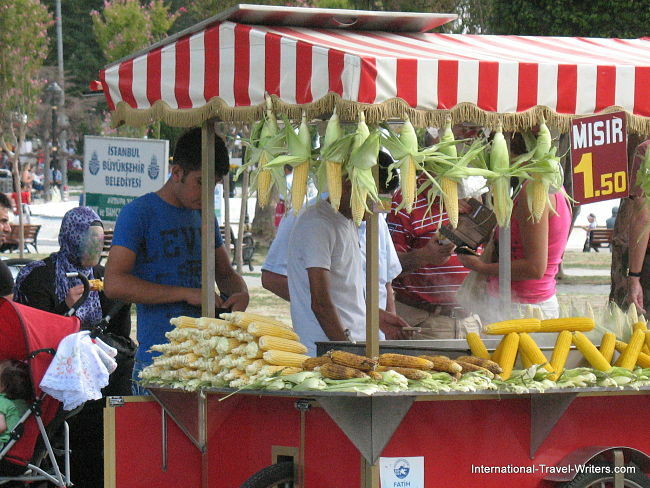 Vendors selling freshly cooked corn are a common sight. They have carts like the hot dog carts you see in New York and Chicago, mobile, with wheels, and just change locations when needed. 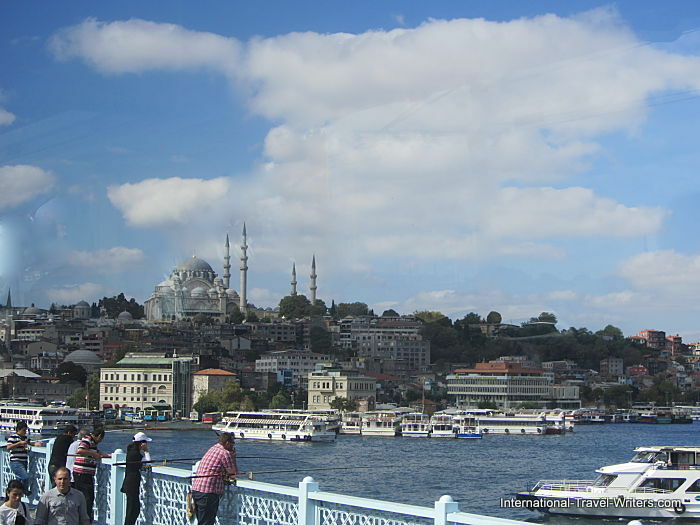 Galata Bridge is where fishermen try their luck and the Yeni Cami (called the New Mosque because it's only 400 years old) dominates the skyline in the distance on the shore of the Golden Horn. 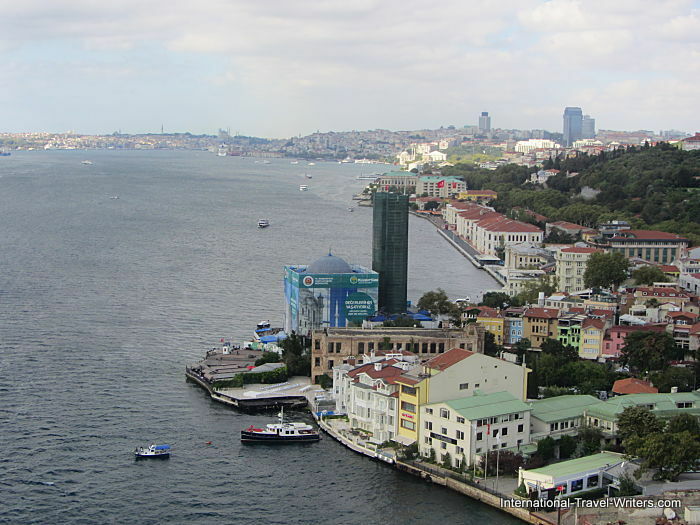 The Golden Horn is a horn-shaped gulf, an inlet of the Bosphorus River that divides Istanbul and forms a natural harbor. 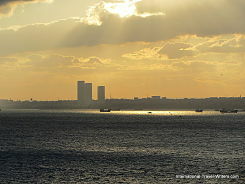 Thus, it forms a peninsula, the tip of which is "Old Istanbul" at the point where it joins the strait and enters the Sea of Marmara. 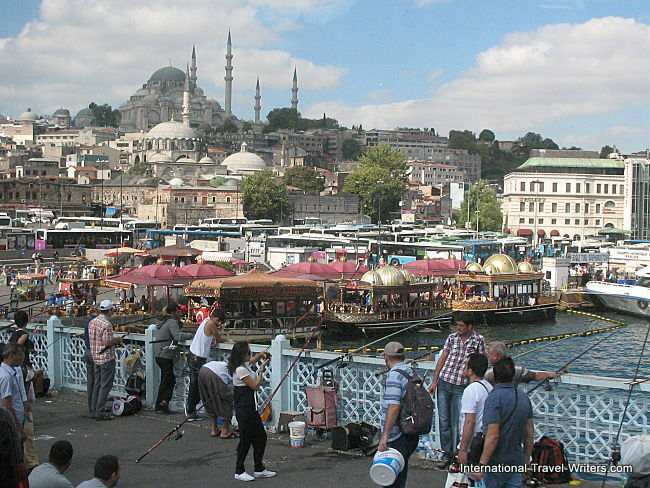 Numerous fishing boats sell their catch along the dock near the Galata Bridge and enterprising young chefs fashion tasty fish sandwiches made with a pita-style bread with the freshly cooked catches. 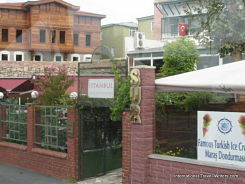 Zinhan Kebap House at Storks...this is a famous restaurant with a prime location next to the Galata Bridge. It has an impressive roof terrace with views that knock your socks off! There are lots of well-positioned tables where you can enjoy simple or sophisticated kebab dishes or other offerings such as Tournedos Rossini while you people watch. They also have a well-priced wine list. Note: The building is named "Storks" because Istanbul perches upon the migration route for hundreds of thousands of storks and other migrating species that head south towards Africa. Popular bird-watching spots are up in the nearby Camlica Hills. You see crowds of modern people shopping while nearby there are ancient walls that struggle to survive the passage of time. 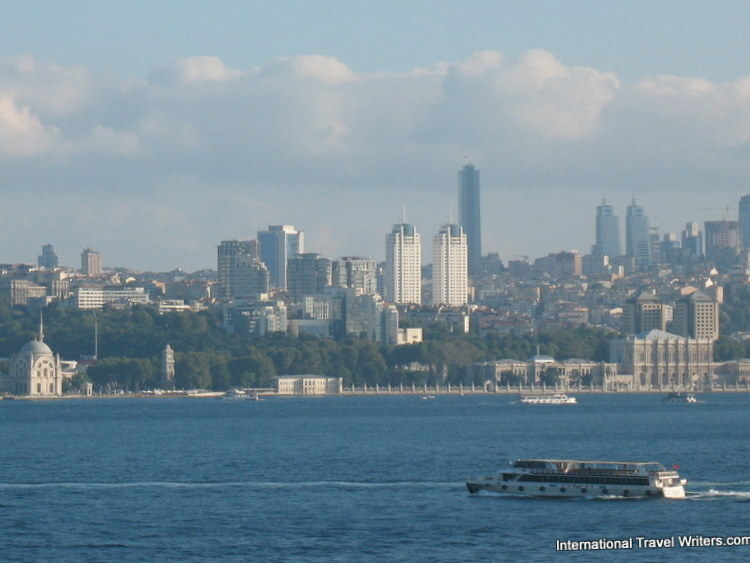 The Dolmabahce Palace is visible on the European shore across the river at the right, the two white towers sitting back from the water are the Selenium Twin Towers (residential and offices), and on the far left the Dolmabahce Palace Mosque adorns the shore. The Dolmabahce Palace Clock Tower (89 feet tall) was added to the Dolmabahce Palace around 1895. It was converted from mechanical to partly electrical in 1979. 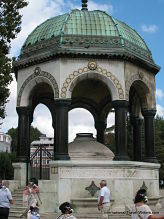 It stands in front of its Treasury Gate on a square along the European waterfront of the Bosphorus. 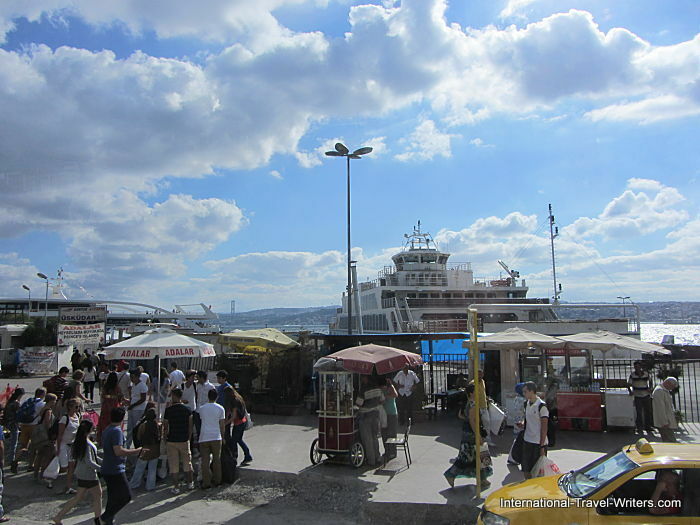 The Golden Horn area is busy with smaller ferries having to compete with the larger ships that are active in the harbor. 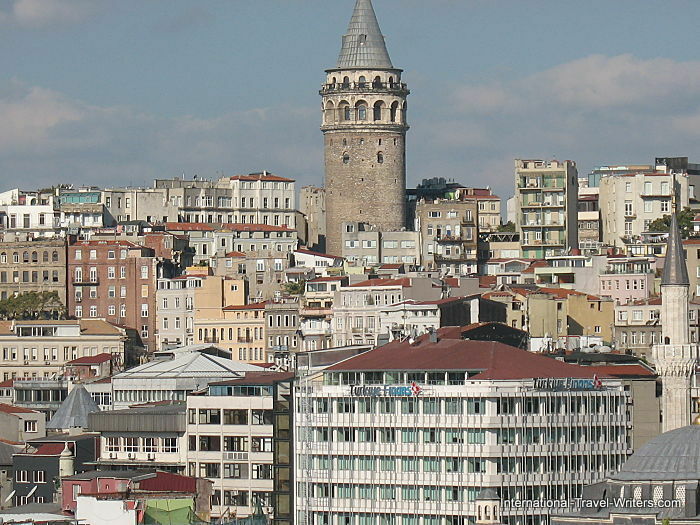 The Galata Tower was built in 1348 and originally termed the Tower of Christ. There is a restaurant and nightclub...or if you feel energetic you can climb to the viewing gallery and take in panoramic vistas of the widespread metropolis. The Bosphorus area with its luxurious enclaves spreading out to immigrant outskirts is one of the most intriguing sections of the city. Galata offers pedestrian paths leading to its active nightlife and the historical Sultanahmet (the oldest part of the city) touts many famous attractions such as the Blue Mosque, Topkapi Palace, Ayasofia and the Grand Bazaar. 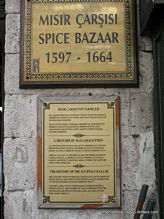 NOTE: Unfortunately, our ship arrived on Sunday when the Grand Bazaar is closed so we substituted with a visit to the smaller Spice Bazaar. So check your itineraries prior to booking and try to avoid the error we made. There are dozens and dozens of mosques throughout this city so keeping track of which ones you've seen is difficult. 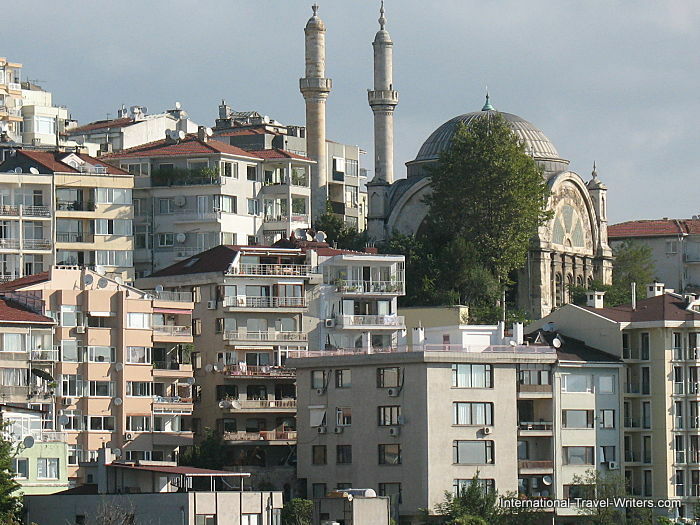 Especially, the smaller neighborhood mosques which, although very beautiful, can slip under the radar. 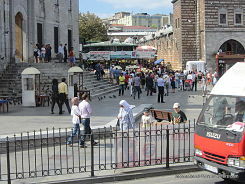 The Ortakoy Mosque is officially the Buyuk Mecidiye Camii (seen below the black tower in the photo above). It was originally built in the 18th century with the current mosque being built between 1854 and 1856. A renovation is currently taking place so it is covered with a colorful blue sheeting telling people about the restoration. 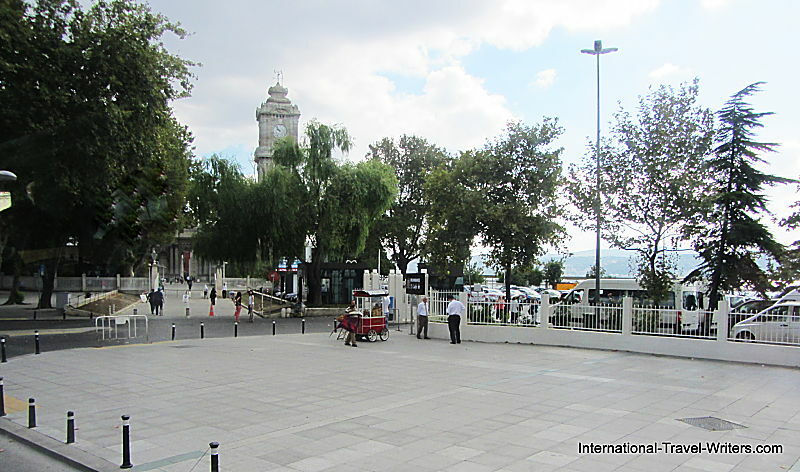 It is situated at the waterside of the Ortakoy pier square. Leaving Istanbul we felt that although we had seen and experienced a great deal of the city...we knew without a doubt...we must return and invest a lot more time to really know this miracle. 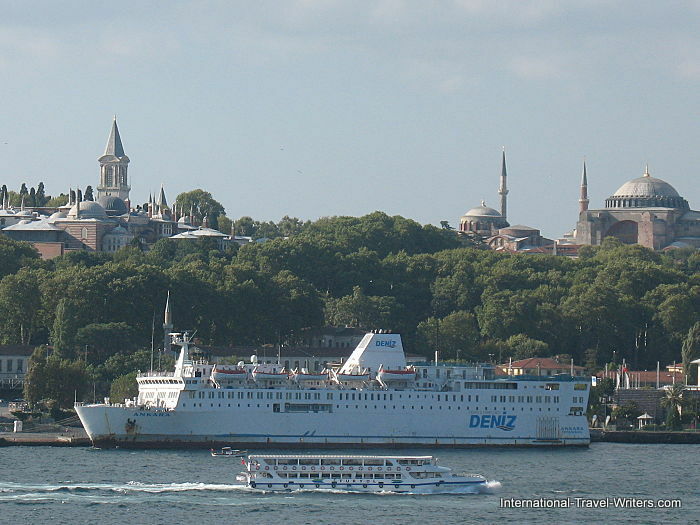 As Napoleon Bonaparte once said..."If the world was one state, Istanbul would be it's capitol".